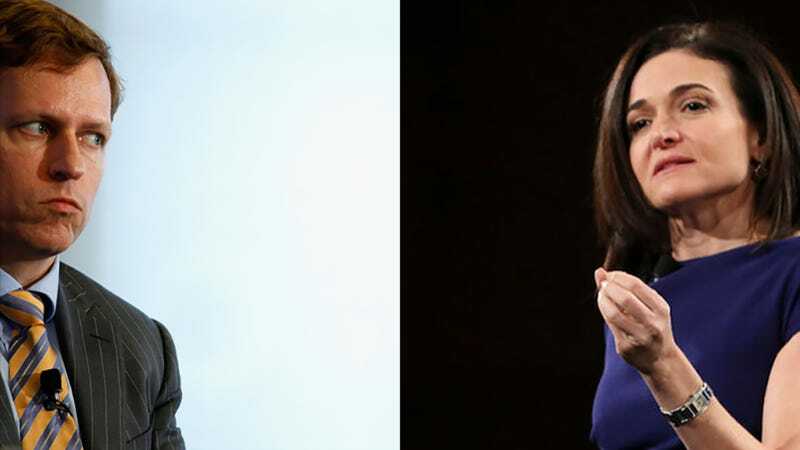 During an appearance at Code Conference 2016 today, Facebook COO Sheryl Sandberg said that Peter Thiel acted independently from Facebook during his financing of lawsuits against Gawker Media, Gizmodo’s parent company. When asked whether Thiel would remain on Facebook’s board of directors, Sandberg said yes, Mashable reported. Thiel, who was one of Facebook’s earliest investors, recently admitted that he has funded lawsuits against Gawker Media. Since his involvement became publicly known, some have called for Facebook to remove him from its board. But on Wednesday, Sandberg—and, by extension, Facebook more broadly—appear to have made the decision to stand behind him. Facebook stands for giving everyone a voice. We believe the world is better when people from different backgrounds and with different ideas all have the power to share their thoughts and experiences. That’s what makes social media unique. We are one global community where anyone can share anything — from a loving photo of a mother and her baby to intellectual analysis of political events. To serve our diverse community, we are committed to building a platform for all ideas. Trending Topics is designed to surface the most newsworthy and popular conversations on Facebook. We have rigorous guidelines that do not permit the prioritization of one viewpoint over another or the suppression of political perspectives. Whether or not Zuckerberg is forced to address the Thiel situation at the 11 a.m. stockholder meeting at the Sofitel San Francisco Bay in Redwood City, his thumbs-up, or down, vote will be the most forceful statement he can make about his board member — a man who some argue is setting a chilling precedent for media companies that publish stories not to the liking of powerful billionaires. Will Facebook, a company dependent on publishers for the content that fuels its News Feed, stand by a board member seeking the destruction of one of those very publishers? Sandberg, however, dismissed similarities between the two situations. “When he did his tweet, it almost looked like he was talking for Facebook,” she said. In Thiel’s case, Sandberg said the distinction between the person and the company was clear enough. “We decided not to comment,” she added.